Oblique aerial view centred on Castle of Burwick promontory fort and possible monastic settlement, taken from the SW.
OS 6" map (1900) . 'Castle of Burwick' applies to the remains of an ancient tumulus. On the west side, where a portion of the earth has been removed by storms, a great quantity of broken bones is discernable, also two stone cists formed of thin slabs. A number of the latter are said to have been removed for various purposes. A long peninsula connected to the W shore of the island by a narrow neck has apparently been occupied by a stone structure, but owing to the fragmentary remains, no guess can be made as to its character. The neck of the peninsula, which has been the only means of access, has been defended by at least two ditches, the upcast forming three mounds. The highest point of the site has been dug into and a large rim fragment of coarse pottery was picked out of the excavated hollow in 1929. It is now in the Museum of the Antiquarian Society at Kirkwall. 'Stone Cists' are noted on the OS plan as having been found here but no traces of them survive. On the cliff edge at the NW corner of the site a small kitchen- midden was observed. 'Castle of Burwick' a promontory fort with secondary buildings, probably an early monastic settlement. The promontory has been cut off in the E by three ramparts with medial ditches behind which the head of the approach has been further defended by a wall, (now collapsed and robbed) surviving as a grassy scarp. Behind it are traces of a rectangular building (12.0m N-S) the W side of which has been destroyed by cliff erosion. Exposed in the cliff at this point are traces of dry stone walling and several upright slabs (possibly the alleged cists of the Ordnance Survey Name Book, ONB) as well as limpet shells, animal bones and burnt stones. A flint nodule was picked up here during field investigation. 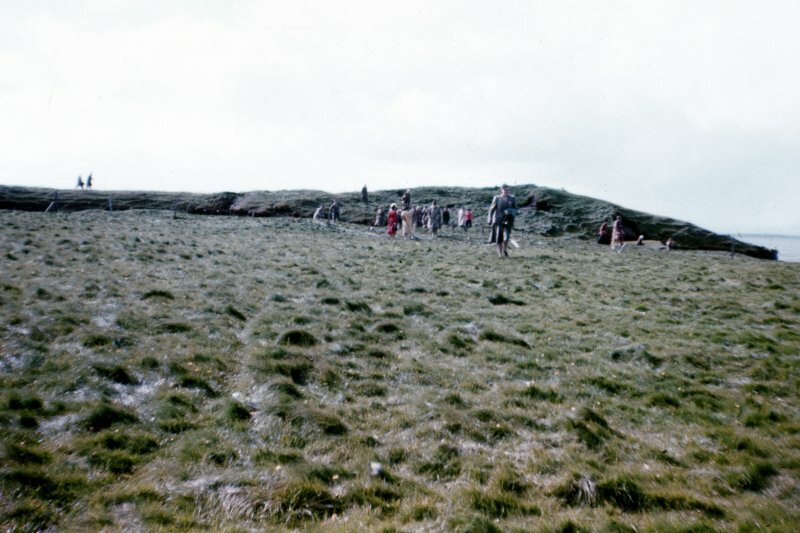 The remainder of the promontory is occupied by the grass covered foundations of about ten rectangular buildings with rounded corners, similar to those at the Brough of Deerness. A slight ridge along part of the E side of the promontory suggests that a wall or turf dyke ran along the cliff at this side. Sponsors: Historic Scotland, Orkney Archaeological Trust. G Wilson and H Moore 1997. 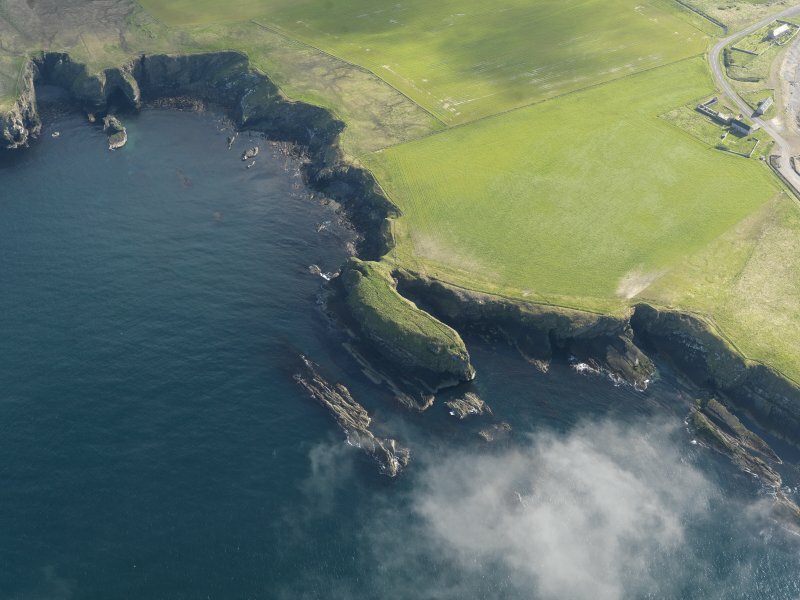 The Castle of Burwick is almost an island, for it is joined to the mainland only by a very narrow neck of land, although this may have been somewhat wider in iron-age times, and the cliffs are high and sheer. Three lines of rampart with ditches between them have been built on mainland to guard access to the fort, and a fourth rampart lies across the approach on the fort side; in the long grass within the forts, there are traces of structures, presumably houses, beneath the turf. Preserved within St Mary's Church at Burwick is an oval boulder, known as the Ladykirk Stone, which is carved with a pair of footprints, but its original provenance is unfortunately unknown. Elsewhere in Scotland such carved foot-prints (always of shod feet) are thought to be associated with ceremonies surrounding the inauguration of Dark-Age kings, symbolising the idea that the new king will follow in the footsteps of the old. Although the powercentre of Pictish Orkney is thought to be the Brough of Birsay (no. 49), there may have been more than one such centre, and it is not impossible that Castle of Burwick was in use at this time. The remains of a defended Iron Age fort and probable secondary monastic settlement occupy a small promontory surrounded by sheer cliffs. The promontory is joined to the mainland by a narrow, eroding rocky ridge. Access to the ridge is restricted by three earthen and stone banks, which extend across the greater part of the neck; a short passage between the banks lies to the S side. The banks are up to 2m high and 5m wide. A series of ditches, which originally accompanied the banks, are now visible as shallow depressions. A fourth bank is situated on the landward side of the promontory. Traces of the footings of a rectangular structure (12m N-S) can be discerned to the rear of this bank. The remains of a further ten rectangular structures, with rounded corners, are spread over the promontory. The entire promontory is badly eroded and access is hazardous. Archaeological deposits can be seen eroding from several exposures on the promontory. The largest exposure lies to the NW side, where there has been recent large-scale ground slippage. Fragments of masonry and anthropogenic soil deposits are strewn over the sheer cliff sides. Deposits of stone and a silty soil containing shell can be seen in a smaller exposure to the E side of the promontory. A precipitous promontory on the W coast of the Burwick headland, which itself lies on the W coast of South Ronaldsay, is defended by a series of ramparts and ditches. Forming a long narrow hammerhead and measuring about 100m from N to S by up to 26m transversely, the promontory is linked to the mainland by a narrow neck at the N end of the E side, which also forms a shallow saddle. A stony scarp on the seaward side of the saddle is probably the innermost rampart, outside which at least three and probably four ditches have been drawn across the neck, the innermost straight across the narrowest point and the outermost in a gentle arc; they are separated by upcast ramparts up to 5m in thickness by 2m in height. While the neck provides the only access, the exact position of the entrance is unknown. To the rear of the inner rampart, there are the footings of a rectangular building measuring about 12m from N to S by 4m internally, and the remains of at least ten other buildings can be seen elsewhere, leading to comparisons with monastic sites such as the Brough of Deerness (Lamb 1973, 78); in addition traces of a turf bank extend along the length of the E margin of the promontory. Midden material has been noted eroding from the cliff-edge along the W margin of the promontory ever since 1929 (RCAHMS 1946, 285, no.817; Wilson and Moore 1997), and this probably accounts for the description of broken bones appearing in the Name Book (Orkney, No.20, p 327), though whether the two supposed cists recorded then were the remains of burials or the fittings of internal buildings is unknown. As described. The northwest corner of the promontory has sheared off in the past, exposing drystone structures and midden deposits in sections on both sides of the collapse. This appears to have been a geological collapse, although probably exacerbated by erosion at the cliff base. Only a tiny fraction of this monument is impacted, and the nature of the erosion is sudden, dramatic high, hard cliff failure along bedding planes and fault lines.